(Phys.org) —The most luminous galaxies in our universe are not particularly bright in the visible. Most of their energy output (which can be hundreds or even thousands of times more than our Milky Way's) is emitted at infrared wavelengths. The power source of these galaxies is hyperactive bursts of star formation and/or activity around a massive black hole at a galaxy's nucleus, a so-called active galactic nucleus (AGN). The radiation from these processes is absorbed by dust that then re-emits it in the infrared. Astronomers suspect that many normal galaxies, even including our own, have undergone a phase of luminous activity at some time in their past. The manner and degree to which AGNs affect their surroundings is a critical part of a galaxy's evolution, and astronomers are working to quantify the associated processes. In one scenario, a supermassive black hole can exert a strong but relatively brief influence (over about ten-million-years) to suppress star formation in its host galaxy. Such feedback is thought to occur when radiation from the accretion disk around the black hole drives a wind of partly neutral, partially ionized gas into the galaxy that depletes it of the fuel needed for star formation. This kind of feedback is thought to be particularly effective in galaxy mergers shortly after the two nuclei have coalesced. Infrared luminous galaxy mergers, which often harbor both high rates of star formation and luminous AGNs, are thus prime sites to study the properties and effects of AGN feedback. 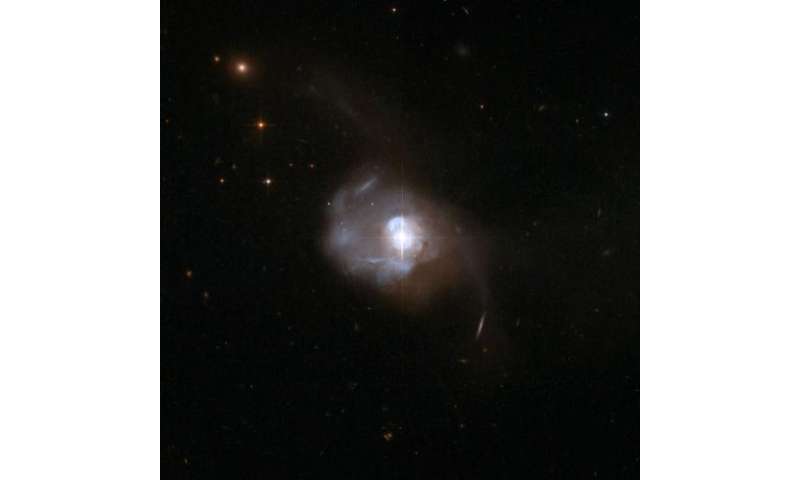 CfA astronomer Howard Smith has joined with a team of colleagues to use the Herschel Space Telescope to study twenty-four infrared luminous galaxies in the radiation emitted by gas via the simple hydroxyl molecule, OH. This molecule is abundant, and a strong producer of infrared radiation at very long wavelengths that are not absorbed by dust and so can be seen unobscured. Two years ago Herschel astronomers reported discovering strong galactic nuclear winds using this molecule as a diagnostic, and this new study of twenty-four luminous systems represents a systematic attempt to probe the nature of these winds with this new molecular tool. The team reports finding that the nature of the OH line varies considerably in detail between sources, but overall can be grouped into four categories categorized by whether it is seen in emission, in absorption, in a mix of both, or is absent. When the lines are seen, however, they reveal the presence of very fast motions in the wind, up to 2000 kilometers per second; there are as much as 200 million solar masses of material in these winds. In this first paper of a series analyzing the different galaxy types, the scientists speculate that the nuclear winds may be an early phase of disrupting the dust around the supermassive black hole. In this case, these objects may evolve before long into more prominent, optical sources like quasars. More information: Spoon, H. et al. Diagnostics of AGN-Driven Molecular Outflows in ULIRGs from Herschel-PACS Observations of OH at 119?m, ApJ 775, 127, 2013. They do? Well this is certainly a concession to LaViolette. He has maintained this theory for decades. Here is a scenario based on his work. Perhaps astronomers should take a look at my comments. Is the central bare core very windy?